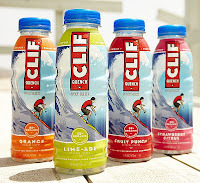 Clif has joined the bandwagon of electrolyte drinks with this new product. It claims to increase performance with an ideal mix of carbohydrates and eletrolytes. I tried this in the Fruit Punch flavor one day after I ran 12 miles, which was my dinner along with a handful of raw nuts. Unfortunately, as I opened the fridge to get it, the bottle fell to the floor and burst open, leaving only half of the 90-calorie bottle for my consumption. I was pleased that it didn't taste chalky at all -- then again, it doesn't contain any protein. It mostly tasted like a watered-down punch, which "The Ukrainian" did not like at all and insisted that this be consumed cold (I believe the packaging says so as well). As for me, I was so desperately thirsty that I enjoyed my half-bottle. Still, I had given up on sports drinks long ago, even through marathons, because gels seem to upset my stomach less. If you are into sports drinks, this might be one for you to try, particularly DURING a workout. This drink comes in four flavors: orange, lime, fruit punch, and strawberry. Sports drinks make me feel sick too, but I hadn't seen this yet. Thanks for sharing!